For Christmas this year, I got my wife a Fitbit Flex activity tracker. 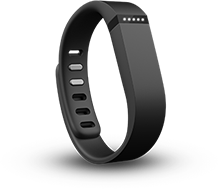 If you're not familiar with it, the Fitbit is a personal fitness tracking device that you wear on your wrist. It uses its several sensors to track things like steps walked, distance walked, calories burned, active minutes, and sleep cycles. At CES this year, fitness devices were a big deal with everyone from Epson to Sony announcing their own version of personal fitness trackers. They're all a bit different and some do more tracking than others. But they all follow a similar theme: wear this device on your wrist to get information about your body and your activities. The Fitbit definitely works. It accurately tracked steps and distance, and it also seemed to do an accurate job with calories and sleep, though I have no way to prove it. The device you wear wirelessly syncs to your phone or desktop computer, it gets about a week of battery life, and is waterproof enough to wear in the shower or pool. The app it syncs to looks and functions well, and provides very cool graphs and charts for steps walked, sleep patterns, etc. Some of the other fitness trackers do extra stuff like track heart rate, remind you to move if you've been active too long, and automatically go into and out of sleep mode (the Fitbit requires manually telling the device when you go to sleep and wake up). But...it's just not useful. My wife wore it for about a week and decided it wasn't useful for her, and I wore it for 4 days before coming to the same conclusion. No matter how much I tried, I simply could not think of a reason to keep wearing it. Sure, now I know how many steps I've taken every day and how many minutes during sleep I was "restless," but I simply don't need that information. It's like knowing how many times I put my sunglasses on in a given day, or how often I blinked. Sure the data might be interesting, but it's not all that useful. In all fairness, I'm not a fitness buff. I don't work out, I'm not trying to lose weight, and I get enough sleep already. So the information provided by the Fitbit would doubtlessly be more useful to someone who is looking to use the information to make changes in their lives. But for an average person like me, I simply didn't see any reason to keep wearing it. I think fitness devices like the Fitbit are going to mature quickly and gain features over the coming years. There probably will be a day when most people wear something like this (or it's integrated into our phones or watches) so that we can know more about what's going on in our bodies. Imagine a day when your watch (or a fitness bracelet) can track blood sugar, cholesterol, stress level, blood pressure, heart rate, and maybe even what type of virus is infecting you. It sounds far fetched, but it'll surely happen. When that day comes, we could see a revolution in health care when each person always has details that we have to visit a doctor to find out today. So there is definitely a future in these types of devices. But for now, I don't think the average consumer is going to be interested in them. But time will tell, since the market is about to be flooded with variations of fitness tracking devices. We'll ave to wait and see if they become as popular as the manufacturers hope. Anyone wanna buy a gently used Fitbit?